Destiny: Xur weapons, gear, and location, October 21 - 23: Hawkmoon! Xur, Destiny’s weekend Exotic trader, semi-legendary am-dram tenor, and three-time Olympic cycling technician, is back. This week he’s in the Tower, over near the bar jukebox. He hasn’t got any money, but he’s trying to teach himself that thing Fonzie can do. He’s been at it for four hours. So what’s good? Firstly, Hawkmoon. With its range cranked back up to 35, after being nerfed in Year Two, if it’s not quite back to the standards of its former self, then it’s pretty close. Packing ludicrous impact, great range for its class, two different perks for increasing the power of random bullets (activate them both and you’ll get at least three shots in every mag at 20% extra damage), and the optional Range Finder to power up its distance-shooting even further, it’s basically great fun. Grab it. Shoot things. Enjoy. As for the armour? Less cool. The Warlock’s Stag probably has the most inverse ratio of visual grandiosity to actually-exciting-perks around. It basically just gives you a faster Super recharge, once per life, when all of your team-mates are dead, which makes it incredibly situational, and distracts from the fact that all you should be doing in that particular situation is reviving like crazy. There’s also a chance to respawn with an overshield, but giving that you get one guaranteed when being revived, that’s not entirely exciting. The Immolation Fists are better, giving Titans the Explosive Pyre perk for free, meaning a great deal more freedom in your builds while delivering chain explosions with your hammers whenever you damn well want. And the Hunters’ Skyburners Annex is the source of several decent, interconnected, ambient perks, but you’ll have to reduce your Super use to get the best out of it. It gives you a chance of generating orbs on Heavy weapon kills, making a decent support boon to your team, but it also gives you extra Special ammo when you collect orbs of your own while your Super is charged, and bonus melee energy on all orb pick-ups. And you can optionally collect bonus Super energy from Heavy weapon kills, speeding the whole process along. If you work with a decent team and want to amplify your collective Super charging, it’s a handy, if not spectacular, utility Exotic. 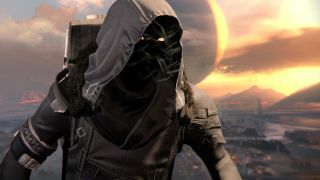 As ever, Xur will be around until 10am UK / 2 am PT on Sunday, at which point he’ll shuffle away another week, hand no-doubt streaming with blood, and disappointment in his eyes.